Many types of backyard birds enjoy eating birdseed cakes. These cakes are easy and inexpensive to make at home. They will attract nuthatches, chickadees and even woodpeckers. This basic recipe yields approximately 12 6-ounce bird seed cakes. It can easily be modified to attract specific birds if you are aware of their favorite treats. Add one cup of beef suet to a large saucepan. Heat the suet on low flame for 4 to 5 minutes, or until heated through. Add one cup of peanut butter and six cups of corn meal to the suet, and stir to thoroughly incorporate all ingredients. Heat for an additional 2 to 3 minutes to ensure the mixture is pliable. Remove the pan from the heat and set aside. Line a cupcake or muffin pan with twelve paper cupcake liners. One large (12 muffin) pan or two small (6 muffin) pans should be used. Spoon the birdseed mixture into the lined cupcake or muffin tins until each cup is about halfway full. Allow them to cool completely. They should harden in about 1 to 2 hours. Remove the birdseed cakes from the paper liners and place them in a plastic freezer bag. Label with the contents and freeze until ready for use. 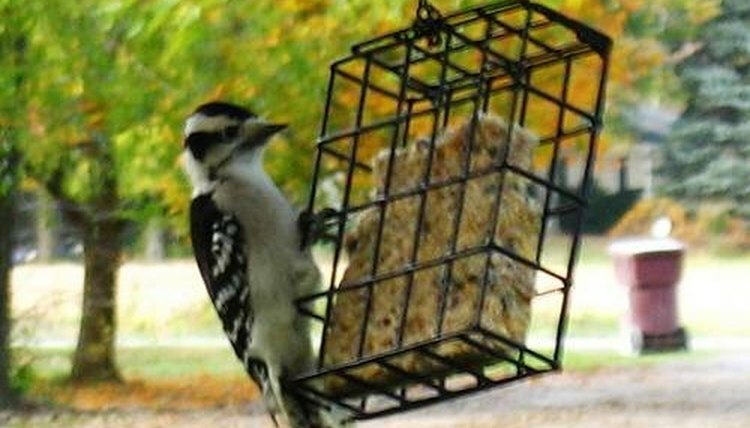 Place the birdseed cakes in your regular bird feeders, or set them out on fence posts or anywhere birds will be sure to find them. Thawing the cakes is not necessary.